Ittybittyprettykitty: Lime and Dandy cotton candy! So not quite cotton candy, but soap! Bomb Cosmetics soap to be exact, and what a delightful little soap this is. Those who have been following this blog for a while will know my ever so slight obsession with Bomb Cosmetics, and this is one of my latest acquisitions. Unfortunately (or fortunately depending on your point of view! ), the Boy has terrible taste in shower soap, and I was forced to obtain something a little more skin friendly. Enter Lime and Dandy! A zesty little block of wake up and go. And at £2.49 it's not going to break the bank. Bomb Cosmetics pride themselves on their handmade nature, and nowhere is this more evident than their quirky soaps filled with odd swirls and patterns. Still can't quite work out what it's supposed to represent, but hey. This soap is wonderfully mild to the skin, but does take some effort to lather. I would recommend using it with a scrubby sponge to get the best out of it. 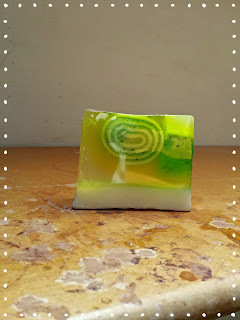 The lemongrass scent starts off quite powerful, but calms down after a while and leaves you with a bright smell of lime to take you through the morning. Thus far the Boy hadn't complained too much about the "girl soap" invading his bathroom, so I call that a success. What about you guys? Any tips on trying to convince your other halves that "girly" bathing products aren't that scary? Any products you've both found a resounding success?